Hope you have some chocolate to eat today while you are stitching. Happy Halloween!!!!! I 've been making pillowcases to donate to the American Patchwork and Quilting 1 Million Pillowcase Challenge. I just finished these 8 yesterday. As I stood outside and looked at these pillowcases, it brought back memories of when I was younger and everyone on our street had a clothesline. Can you still remember what your bed sheets smelled like the night after they had been washed and dried outside in the fresh air on your clothesline? Both of our clothesline posts had blue morning glories that vined all over them. I miss those days. I made this group of pillowcases earlier. The pink tulip fabric and the one with the artist's paintings with cat faces were given to me by friends. These next photos are fleece blankets that I've made to donate to Project Linus. They are having a Make A Blanket Day where we sew labels onto the backs of the quilts, but I won't be in town to go this time so I'll drop mine off next week. To make these blankets I use a skip stitch blade that I ordered from the Project Linus website. The blade perforates the edges of the fleece leaving holes to use to crochet an edging. I enjoy crocheting around these. I can do one in a couple of evenings, and it makes for good TV work. I've been working on some blocks for scrap quilts in between the pillowcases. Hope you are stitching today, too. As I surf around blogland on Monday mornings, I always see bloggers talking about Design Wall Monday. Well, up until this past weekend, I just had a piece of foam core board that I'd bought at Hobby Lobby to use for a design wall. It was 4' X 6', and I couldn't use the bottom corner because I had to really bend it to fit it into my car. That board would hold a few blocks but not enough that I could arrange them into a larger sized quilt. For a long time I have had Design Wall Envy. I first saw ﻿this idea for a design wall over on Susan's blog, The Thread and I. Then I went to a friend's house, and she had used the same concept except that her husband had nailed her design wall to the wall using boards. So I asked Bill if he might fix a design wall in my sewing room. His first question was, "Which wall?" So I began moving and shifting things, and here it is......tah dah!!!! a blank wall. First thing he did was nail 1" X 2" boards into the studs. I guess that was in case things didn't go well and I might hang on the wall? Then he nailed this sheet insulation to the boards. I didn't think we would be able to get this insulation home, but there is an aluminum sort of sheet on the back side. So before we left the hardware, he just made a slit down the center of the sheets of insulation and folded them in half. Then when he got them home he just used duct tape. I bought 6 yards of a tan flannel at JoAnns with my coupon and pieced it down the center into one large piece. I used these T Pins along the edges to fasten the flannel to the design wall. I was so excited to put blocks up on the new wall, that I forgot to take a picture of it all finished. These blocks are only taking up a part of the wall. When you turn from the design wall and look out the window, this is the view from my sewing room window. Hope you are all stitching today!!!! This one is called It's Just A Nine Patch. The nine patches in this quilt finish at 1 1/2" inches. Someone wrote me saying they were part of the Nine Patch Nuts group on Yahoo that was started by one of the Dear Jane group. I'm in that group, too. The ribbon on the quilt was for Judge's Recognition. This is my green Nearly Insane called Lime Phosphate. Over on my Flickr page, I have photos of some of the individual blocks. This is called Fall Foliage Spectacular from the Judy Martin book Cookies 'N Quilts. This is my round robin quilt. I believe the year was 2005. 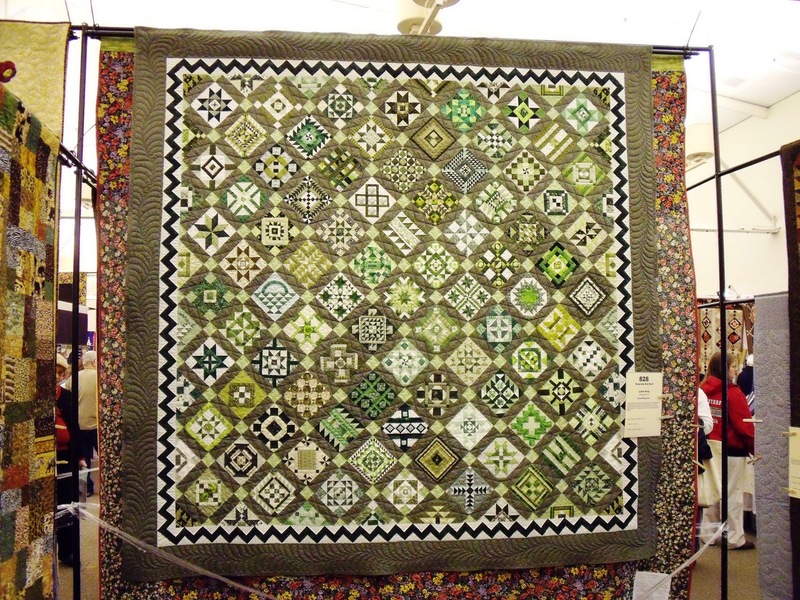 There were 6 of us in the group that year, and all of the quilts were amazing. I'm in a group again this year, and in less than a month we will all have our own quilts returned to us. I can't wait to see mine. 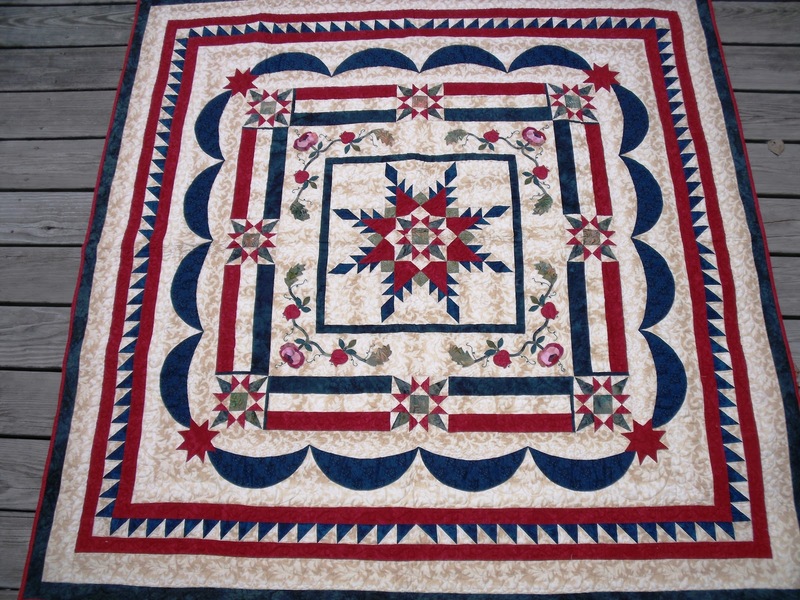 This is my Dear Jane signature quilt from 2002. I had to wait almost a full year after joining the Dear Jane list before I could sign up for the signature swap. I love this quilt. Here are a few close ups of the blocks. Some of these blocks really have a lot of work on them. This one has glitter on the butterfly. This one from Massachusetts has a lighthouse. I love that Kaffe fabric. This one from Holly has little red beads sewn on the wreath for the holly berries. This one from Texas has the Texas flag drawn on it. This one has a little history from the state. This one from Alaska has a moose theme with the stamp on the signature part that matches the fabric. This one is unique and has a lot of work on it. I had so much fun with this first signature swap that I signed up for the next one in 2003. Those are still in the bag...maybe that will be a good winter project. Hope you are all finding some time to stitch today. A friend of mine who is an awesome quilter has a husband that does beautiful woodworking. 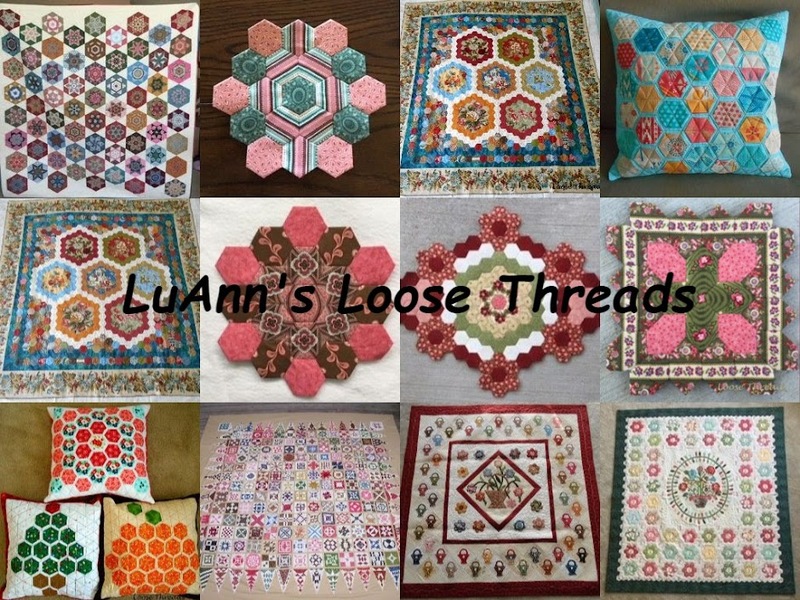 I posted some photos of their house and her quilts a few posts ago. I asked him to make me a couple of quilt racks, and I just picked them up on Saturday afternoon. This one is a free standing ﻿rack made of oak. 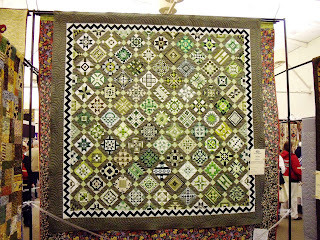 The green quilt is my Nearly Insane called Lime Phosphate. The other one is my mini nine patch called It's Just A Nine Patch. The nine patches in that quilt finish at 1 1/2". This quilt rack is also oak, but it's a ladder. I know you can see that. I really like the other quilt rack, but I am just in love with this ladder. I think maybe that's because you can move it around all over the place. 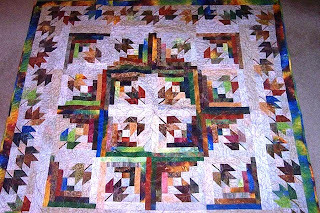 The top quilt is Fall Foilage Spectacular from the Judy Martin book Cookies 'n Quilts. 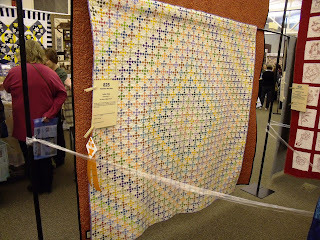 The next quilt is a round robin from 2005 (I think). Several of the girls in that round robin are in the one I'm in now. They all do a great job!!! The bottom quilt is my Dear Jane signature quilt from 2002. I signed on the Dear Jane list in 2001 and just missed that swap, so I couldn't wait until the one in spring of 2002 so I could sign up. Most of these quilts have been either in a cabinet or folded up in a pile, so it's so nice to have them out where we can enjoy them every day. Thanks for stopping by. Hope you are finding some time to stitch today. I did and I've finished a new quilt top. As soon as I take a photo, I'll post it. More soon. This was our Sunday dinner. I have made this dish three or four times so far, and each time it amazes me. This recipe came from my friend Val from Canada. She posted it over on the Dear Jane list so I imagine it's okay to share it with you here. I don't follow her recipe exactly because she can buy spices in Canada that I haven't found here either because they aren't available or because I haven't looked in the right place. I started with stew beef first dredging it in 1/2 cup of flour mixed with some garlic powder, sage, basil, and parsley. Then I add it to some vegetable oil and brown it on the stove while I slice about 4 huge onions into thin slices. After the meat is browned put the onions into the pot with just a bit of water and cook slowly. I am still amazed at how the onions cook down and end up making a sauce over the meat. This dish smells wonderful when it is cooking. After it cooks down a bit, I put it into my crock pot. At this point you can add some paprika. I decided to try something different so I put in a packet of dry Beefy Onion soup mix. I cooked it on low for 5 or 6 hours. Toward the end I added the little bit of flour with spices left after dredging the meat and stirred it into the mix, too. At this point you can put the lid on top and head to your sewing room. I did just that....but I've been working on a round robin that I can't show you. I also have worked on my own project but don't have photos yet. So next post will be quilt related....promise. This is dinner, and it was great. I love these crock pot recipes where you put something together in the morning and then spend the day doing errands or sewing and still have a warm dinner in the evenings. I also think this would be tasty with Italian spices - some oregano and Italian seasoning and serve over spaghetti. Hope you are finding some time to stitch today. Today I bought just a little bit of fabric. I went to the quilt shop to buy some red and green Moda marbles to use on the Dear Jane Christmas signature swap quilt I want to put together. Vivian over at http://sewathomeonpineridge.blogspot.com/ gave me the idea to use a crisp white as a sashing. 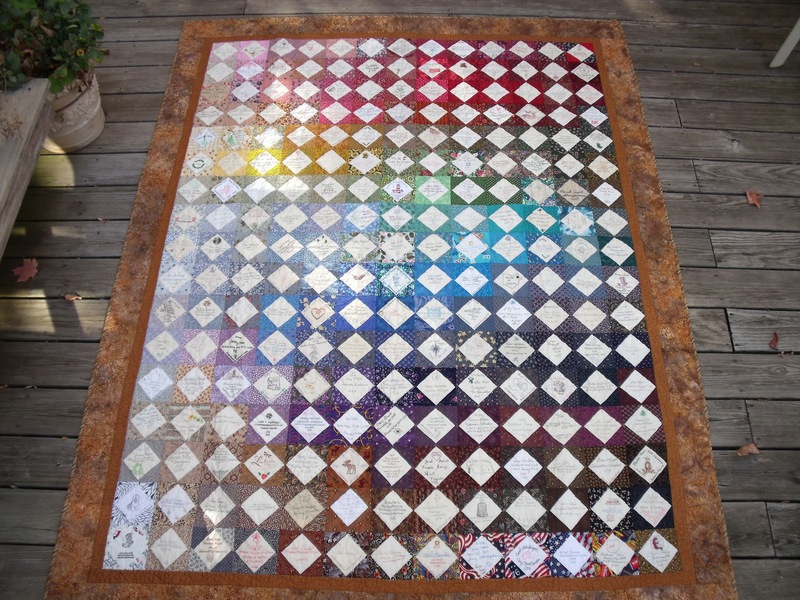 I like that idea, but with only 150 blocks it will be an awfully small quilt although the Dear Jane only has 169. Anyway I bought 2 yards each of Christmas red and green Moda marbles to use with the blocks somehow. Where is it? It's still in the sack, and I forgot to take photos of it. Where is the white for the sashing? I didn't remember to buy it. Why you ask? Well because I found these fabrics. I think they are all Phillip Jacobs, and most of them will go in my Hearts and Flowers applique' quilt. These four fat quarters are what I'm collecting for an I Spy quilt. I don't know who I would give an I Spy quilt to right at the moment, but I saw a good pattern idea that a friend showed at a gathering and I thought I'd better start collecting conversation prints. Always be prepared!!! And, I bought the Turning Twenty book. I've seen a lot of talk on the blogs about Turning Twenty quilts, and I wanted to see what it is all about. There are several variations of the original Turning Twenty book - I believe I saw 6 different ones today. I bought this one because there is a quilt in the book done in all Kaffe fabrics. Now I have to figure out where I put the red and green for the Christmas quilt and get busy on that. Hope you are all busy stitching.....or maybe shopping. Have a good day and enjoy the beautiful fall weather. I've been stitching away on my Hearts and Flowers applique' quilt by Kim McLean. While I've been working on this, I've also been working on a round robin quilt that I can't show you here right now.....but later in November I will after we are all finished and get our own quilts back. 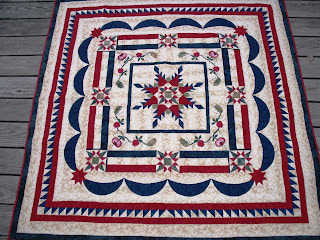 The leaves in the photo below are part of row 3 of the Hearts and Flowers quilt. The hearts will alternate on the third border with the leaves. I have to put the four corners on the hearts to make square in a square blocks. This is my center square so far. I posted it over on the Glorious Applique blog earlier this week. I still have a few of the berries left to add and some of the tongues around the outside. This center measures28 inches now to be trimmed down to 25 inches before sewing on the second border. I believe this is the largest applique' block I've ever done. I am enjoying working with all of these gorgeous fabrics and having fun fussy cutting pieces for the leaves, flowers and berries. The quilt pattern is in Kaffe Fassett's Quilt Romance book. This pot of chrysanthemums is sitting outside my front door. I love fall and all of the gorgeous color. I hope you are all taking some time to do some stitching today or are outside enjoying the gorgeous weather. Love this one from Florida with Santa is swim trunks. This is the pile of them. There are red and green, but there are gold, blue and some black. 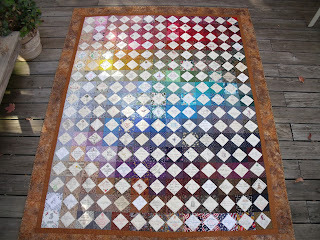 It would be interesting to arrange by color like I did my first DJ signature swap quilt. Ideas??? Hope you are either doing some stitching today or out enjoying this beautiful weather.